On Saturday 25 of March was the tenth Measurecamp in London: a non-profit event, run by volunteers and aimed to share knowledge and experiences in web analytics. Deserves a big big applause, congratulations organising crew!! New approach to internal search. Refine search is a good or bad signal: it depends on what is the objective of the search. Is the user just being curious and looking around or wants to find and buy a specific product? Here, you can compare the search box to a shop assistant, just can help you to find the jackets section or find THE sport light grey size 42 jacket you already have in mind and want to buy in the less time and trouble possible. So it’s not about to have a conversion, it’s about people feeling better, giving them a good experience. The person that’s searching is just being curious or has a commitment, a purpose? Empathy Broker is running a User Test to identify accurately both behaviors, you can participate here: Search Contest; it only will took a few minutes and your help will be very appreciated, and also you can win a weekend in Barcelona!! Craig also talked about AB testing, shared 10 power-ups, among others, convinced us that copying the competition tests isn’t a good idea (because as Peep Laja says: “they may no know what the f*** are doing either”). Then went very fast through 11 Optimisation power-ups, all slides plenty of useful tools you can find in the presentation and that’s going to take me a while to try. Loved that session it gave me lots of work: processes to improve, tools to discover and assumptions to question. Thank you Craig! 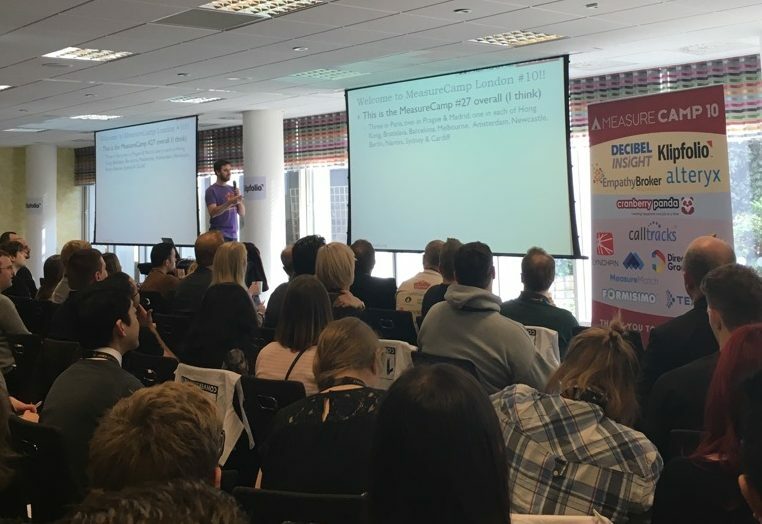 Phil presented an interesting case of an analytics experiment that achieved turning 23% of Direct traffic to 9% and positive identify and separate Affiliates traffic. So, you may think, why such a complication if you can utm-tag the link for each affiliate? Because most of them are missing!! (Affiliates don’t care about measuring, they care most for their commission). Phil run the experiment in a different GA account and used a _ga2 cookie. Also had other different details: setSource utm field rather than setLocation, sessions setting changed to 30 days, declare ga2 object and ga2 cookie, … (and other things that I didn’t completely understand). What matters to me, as I don’t code (..yet- that’s for Simo’s mission) is the wins of such implementation, not only have sensible lower Direct Traffic, but also that’s all done in GTM and saves to email Affiliates re-tag links. Simo was capable of share 30 GTM tips in less then 30 minutes. Those tips were a selection from his post https://www.simoahava.com/analytics/100-google-tag-manager-learnings/. I’m sorry but I wasn’t able to take interesting notes at such speed!! Pieter Baecke and Craig Sullivan introduce us their tool, made with lots on love and aiming to make web analysts life easier. Profit Grid is an online tool that quickly shows you across multiple browsers, Operation Systems and devices a bunch of essential metrics. What I find extraordinary helpful is the funnel builder where you can select for each step pageviews, segments, events and Regex. This is is impossible to do in GA and very laborious and time consuming with other tools like Supermetrics. For those that have something to say but won’t fill the 25 minutes of a session, have the chance share one and to speak for 5 minutes. We listen to @danny_taywitter @SteHughes90 @MontseCano among others. 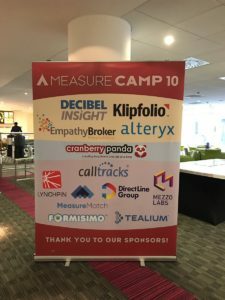 This was my 4th London Measurecamp and I want to thank you and congratulate the London Measurecamp Crew for those 10 editions. Looking forward 10 more! !